Waters was limited against KU and looking at OSU’s newest players. STILLWATER — Another week, another Oklahoma State basketball media availability. 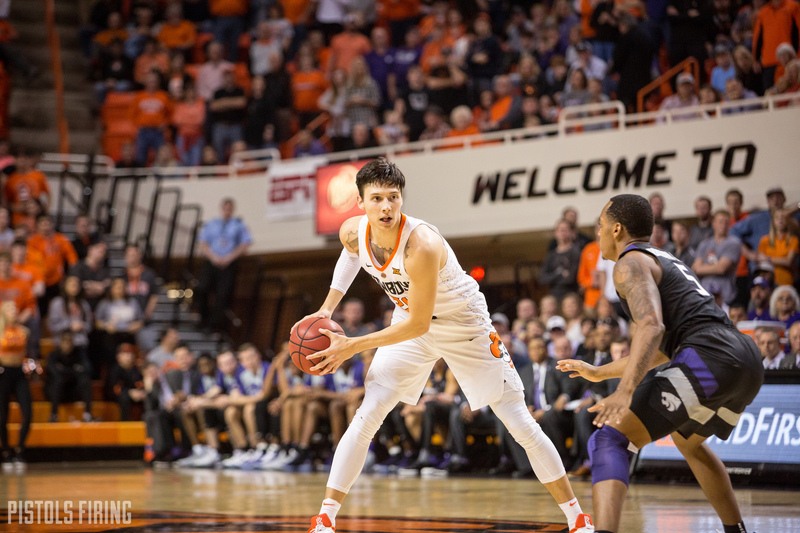 OSU coach Mike Boynton and junior guard Lindy Waters met with the media Monday, and here are some of the highlights. The 30 minutes Lindy Waters played Saturday were the fewest he has played in a game since Jan. 5. Waters has dealt with tendinitis in his left knee, and in his trips to the bench in Allen Fieldhouse this weekend, the trainers met him for treatment. Waters said he is still able to play, and the tendinitis is something he has dealt with for a while now, but as of late with his team-high 33.5 minutes a game, the knee has started to flare up. At practice Monday, Waters had some KT tape on the knee. Mike Boynton will have five walk-ons to go with his seven scholarship players available Wednesday against Texas Tech with the additions of Dee Mitchell and Cade Wagner. Mitchell with wear No. 31, and Wagner will wear No. 40. Both are freshmen. Mitchell, listed at 6-foot-2, is from Jefferson, Texas. He was AAU teammates with OSU class of 2019 signee Avery Anderson. Mitchell was named to an All-East Texas team after his senior season, where he averaged 20 points, six rebounds and 4.5 assists a game at Jefferson High School. Mitchell spent time shadowing Isaac Likekele in Monday’s practice, something a bit unusual, as for the most part, the practice squad guys are teamed up with each other. Wagner is a 6-6 forward from Highland Park, Texas. Boynton said as a whole, the practice squad has been more involved of late, taking part in team activities such as meetings, film sessions and weights, in case there comes a point where they have to play. A quick YouTube search of the name brings up countless Ball Is Life highlight reels of the soon-to-be Cowboy. Anderson and his Northwest High Texans played in a tightly contested game with RJ Hampton’s Little Elm last week. Hampton is the sixth-rated player in the 2020 class, boasting offers from Duke, Kansas, Kentucky and OSU among others. Anderson and Hampton battled back and forth, ending in an 83-80 overtime win for Anderson, who finished the game with 39 points. Hampton finished with 50 points and 10 rebounds.